You are here: Home / Coping / Is Your Stuff Making You Feel Worse? 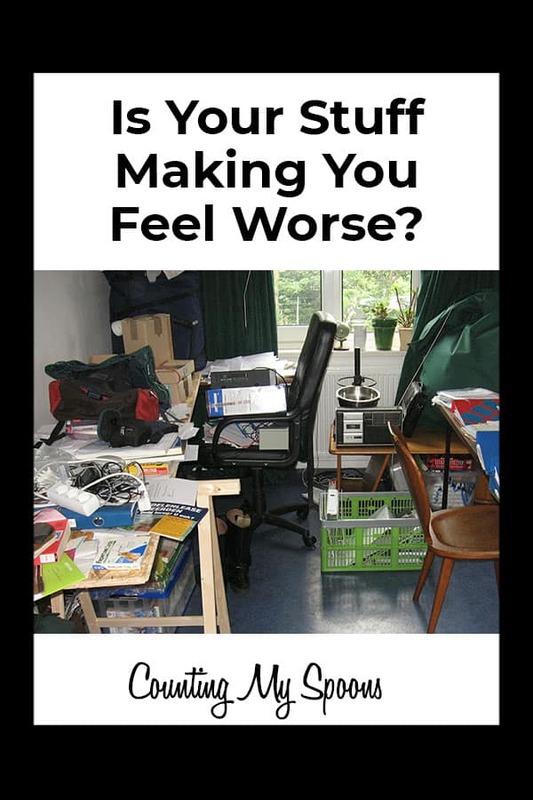 Is Your Stuff Making You Feel Worse? Are You Using Stuff to Fill A Void? Every once in a while I watch one of the Hoarding shows and on a couple of different episodes they’ve mentioned that the person has fibromyalgia. It got me thinking about how we try to fill the void that fibromyalgia puts in our lives. Fibromyalgia takes so many things away from us and we need to be really careful that the ways we choose to fill the voids that are left aren’t making us worse. It’s easy to fill the void with things like shopping, it makes us feel good for the time we are doing it. We pick up that new (or used) item and we feel a little better. Then we bring it home and it becomes one more thing that fills up space. Eventually, our space becomes so cluttered that it causes us anxiety that just makes us feel worse. We are trading our long-term health and sanity to feel better in the short term. I’m not a big shopper but I do understand shopping therapy. It feels good to get something new, to find something that I think might make feel better. I do it, I shop online or sometimes I head to a store. I often see things and think oh I could use that. Arts and Crafts was an area where I used this so much. I amassed probably a couple of thousand dollars worth of art stuff. Clothes. I just cleaned out my closet and donated over $1000 (donation value) of clothes. After cleaning out my closet I still have a full wardrobe (and then some). I love wine, too, and always have a ton of it in the house. Why? It’s not like we can drink more than a couple of bottles at a time. I used to be terrible about buying books before I got a Kindle. Now I just have a few thousand on my Kindle. More books than I will ever read. I’m not a hoarder. I don’t like clutter. But, for the last 10+ years I’ve lived in a house that was way too big for just two people and a couple of cats. So much space, allows for the accumulation of so much stuff. Now, I’m in the process of moving and with that comes downsizing. I’m literally planning to move to a space that will be less than 1/4 the size of the house I’m currently in. I’m also realizing just how much stuff I have. Do you shop to feel better? Take a look around your house, would you feel better, feel less anxious if you had less stuff? If so, perhaps it’s time to minimalize, to get rid of some stuff. Maybe have a yard sale or sell some things on Facebook Marketplace. Perhaps it’s time to simplify your life. For years I kept my office door shut. It was my combination office and craft room and one of the most cluttered and messy rooms in the house. As a result it also became one of the least used rooms. When I would go into my office, all I could think about was how bad I wanted to clean it up. How much paperwork I needed to file, etc. I knew I needed to do those things, that it would make me feel better. But, I just couldn’t bring myself to do it. It was easier to just ignore the room. Now, I have no choice. I’m doing a massive clean-out and I can’t express just how freeing it has been, and how much stress it has relieved. I feel so better when I walk into rooms and see them being emptied. Here’s how I’m doing it. I’d like to say that I’m starting in a single room and working it until it’s finished, but that’s just not my way. Instead I pick a room to work in during that session. I go through items and put them into one of three piles. I’m keeping very little. I have to really evaluate whether it’s something I am currently using. If not, it’s not being kept. There’s no “I might use this later.” If I’m not using it now. It doesn’t stay. When it comes to clothing I’ve used the “reverse hanger method” for a couple of years. When I swap out clothes at the beginning of a season I turn all the hangers backwards. Then if they are still backwards at the end of the season those items get donated. This year I’ve gone a step further with clothes. I went through all my closets and really asked myself if it’s an item I love (or did I just wear it once just so the hanger would get turned). In the end, I donated about 80% of my wardrobe. What amazed me most is that I still have more clothes than I really need. If I assess and item and feel like it’s valuable enough to make it worth my time and energy to sell on Facebook Marketplace I will list it there. Otherwise, it gets donated. My benchmark is that if I don’t feel I can sell it for at least $5 I donate it. Don’t forget to pace yourself! Pacing has been an important piece of this process. Without it I’d probably be done by now. But, I know I can only do so much. I try not to work more than an hour at a time (even taking breaks during that time). I’ve sold a LOT of things on Marketplace in the last 6 months. I’ve actually been surprised at times at some of the things I’ve sold and how fast they’ve gone. I also apply pacing to selling things on Marketplace. I’d love to just list everything. But, that would mean a ton of messages coming in that I’d have to deal with. I find it easiest to just list about 5-10 items at a time. I think I have about 25 currently listed. Most messages come in in the first 24 hours and slow down after that, with many items selling in that first day after listing. I’ve donated things in the past but this is the first year I’ve really taken tracking it seriously, with the intent to use the tax write-off. So far this year I’ve donated about $1100 worth of goods. (There are lists online that provide you the donation value for tax purposes). That was one car load. The hardest part was making sure I wrote everything down as I bagged it. But, if you don’t care about the tax incentives, then don’t worry about it. Just donate it. In the past, I’ve ever put things by the side of the road and without fail those things disappear long before the trash truck arrives to pick them up. Minimizing and downsizing have been so freeing. I can’t even begin to express it. And, once I started I just wanted to do more. It’s motivating to see things disappear – even more motivating when those same things are replaced with cash. Are you happy or just complacent? Julie, thank you so much for this post! Your tips are practical and you covered new things specific to those of us “with limited spoons.” Some of your sentences are going to play over and over in my head as I’m making tough decisions. Thank you! Glad I could help a little. It’s definitely a process. Absolutely timely! When Christmas is “over with” again (yes, I’m that kind of tired “Grinch), looking forward to dedicating more time and energy to downsizing more. After four kids, and the two boys gone now, we’ve been working towards getting down to one floor. Our goal is to dedicate the lower floor to a “transitional suite” for our girls in the future (or our boys if any need to move back home). It helps to have a goal, right? I feel you. I seem to alternate between loving CHristmas and being ready for it to be over before it starts. This year I’m in the latter mood. Just too much going on. Goals are great! And, you’ll love the feeling of having less stuff.